Christchurch to Mt Hutt Ski area return ski bus. When booking, only one child aged 10 years and under is allowed free per full paying passenger. Please be at your designated pick up point 10 minutes prior to departure. For every one paying guest, you get one child 10yrs or under. Methven Travel works closely with Mt Hutt to provide a seamless transport service to Mt Hutt for skiers and snowboarders. 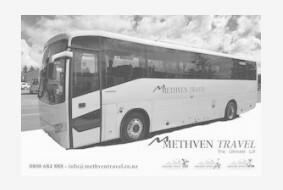 The Ski Buses pick up around town before departing Methven and also drops off at your accommodation on your return to Methven. We are also able to provide ski bus transport for large groups. Please contact us for more information. - Corrosive materials (such as alkalis, acids, wet cell batteries, mercury). - Explosives (Fireworks and articles that are easily ignited). - Flammable liquids and solids Poisonous, toxic, infectious substances. - Compressed Gases (Deeply Refrigerated, Flammable, Non-flammable and Poisonous). - Other dangerous goods (such as offensive or noxious materials). A non-skiing, snow experience for those wanting to see and touch some snow! From Christchurch, our bus will transport you to Mt Hutt ski area, via the very scenic Rakaia River Gorge for photos. Once you arrive at Mt Hutt ski area, you can enjoy and have some fun in the snow, Travel to the top of the mountain on the Chair-lift, experience how a ski area operates, and enjoy your lunch at the mountains Hubers cafe. Depart Mt Hutt for the township of Methven where you can explore this ski and farming town with its shops, cafes, and Agricultural & Alpine encounter which is included in the price. Sturdy footwear required - snowboots and 'shoe chains' are available for hire on the day. Methven Travel provides regular transport services from Christchurch Airport and surrounding hotels and motels to Methven and return. We don't charge for ski and board bags! During the winter months while Mt Hutt Ski Area is open we operate up to three scheduled services per day. Travel time approx 1hr 15mins. We also operate a service to Christchurch Airport to meet flights at which don't match with our scheduled services - please contact us for more information.